Since I didn’t go see family over the holidays, I’ve run away from Colorado for the weekend to spend time with family in NYC and Boston. New York can be stressful. I’m one of those people who slams the imaginary break in the car when driving with other people, so NYC taxi cabs are possibly one of the most stressful experiences of my life. That combined with the 5 hours of travel time means I was pretty ansy by the time I got to the hotel. I had about 30 minutes before the rest of my family arrived, so I decided to get in a quick hotel room workout to get my sillys out. So I present to you, a quick hotel room workout, complete with awkward poses and faces. I started with 15 modified “box jumps” onto the bed. My trainer always makes fun of me for having no vertical leap, but I swear it’s slowly improving! (Although it’s not hard to improve from my original 2 inches). Followed that up with a minute plank. Then attempted to do 20 pistol squats on a bench. The squishy fabric tested my already awful balance and added an extra challenge. Followed by 30 sit ups and 50 mountain climbers. Then I felt my upper body needed some attention, and wanted to utilize the double bed somehow. So I did some creative pushups. Followed that up 30 burpees, 25 dips using the same bench as the pistol squat. 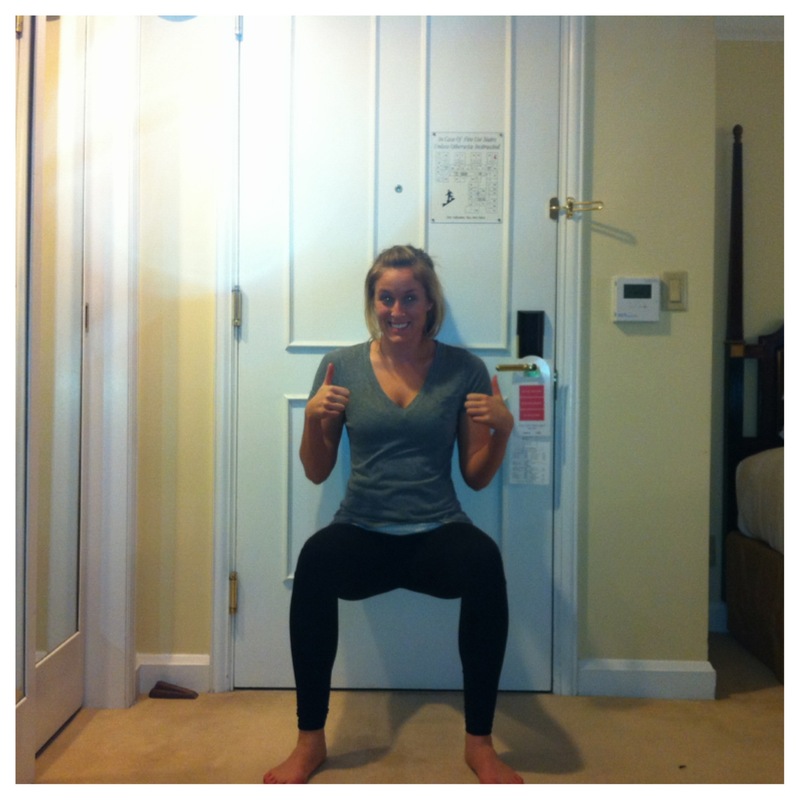 Finished it up with a two minute wall sit. Now I’m off to enjoy some lunch and then later might take a run through Central Park. Happy Friday Everyone! This entry was posted in Fitness, Workout and tagged Fit, fitfluential, health, Paleo, vacation, Workout by fionaboger. Bookmark the permalink.